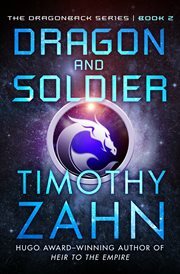 The item Dragon and Soldier, Timothy Zahn, (ebook) represents a specific, individual, material embodiment of a distinct intellectual or artistic creation found in Charlotte Mecklenburg Library. The adventure and danger levels crackle (Booklist) in the second book of the Dragonback saga by the #1 New York Times-bestselling author of Star Wars: Thrawn. Even though he's been on the run from the law for a while, young Jack Morgan never wanted a bodyguard. But that's what he got when a desperate alien named Draycos bonded with him for survival. When all is well, Draycos looks like nothing more than a tattoo on Jack's back. But when Jack's threatened, the K'da warrior appears in his true, dragonlike form. Now, Jack's indebted to his new symbiotic friend for saving his life, and feels obligated to help Draycos fulfill his vow to discover who's behind the plot to eradicate his kind. All they know for sure is that whoever annihilated the fleet of K'da refugee ships used mercenaries to do their dirty work. To investigate, Jack signs up with a merc outfit known for using teenagers to fill their ranks. But life in the military is far more unpleasant than Jack bargained for-and it turns out he's not the only new recruit who isn't what they appear to be . .